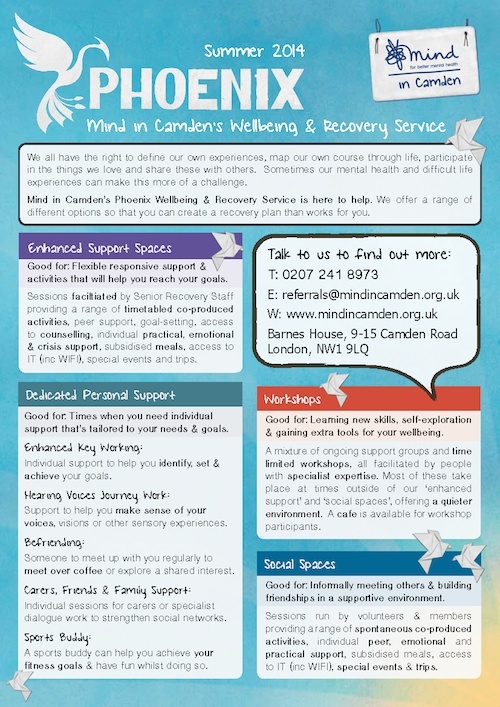 Following it’s launch on 3rd February 2014, Mind in Camden’s Phoenix Wellbeing & Recovery Service has launched its new summer timetable for May onwards. This program combines some of the most popular aspects of the Spring timetable, whilst introducing some new workshops and support options. New for Summer 2014: What’s Cooking?, Open Mind, Photography, Radio Ga Ga, Food & Mood, Voice Collective Young People’s Hearing Voices Group (16-25), Managing Anger, Men’s Health & Moving Journeys. Carers, Friends & Family Support: Choose from up to 6 free Individual sessions for carers, or specialist dialogue work to help strengthen social support networks. Sports Buddy: A sports buddy can help you achieve your fitness goals and have fun whilst doing so.